After going public with his Alzheimer’s diagnosis in 2011, Glen Campbell embarked on a final tour in support of his then recently released Ghost On The Canvas album. Director James Keach followed Campbell, capturing the journey for his film Glen Campbell: I’ll Be Me. The documentary, released last August, centers on Campbell’s struggles with the disease and goes behind the scenes of the tour. An EP co-produced by Dann Huff, consisting of five tracks, including three by Campbell himself, accompanied the film. A full-length soundtrack was released earlier this month. The album includes “I’m Not Gonna Miss You,” which Campbell wrote with the soundtrack’s co-producer Julian Raymond. His final studio recording, the track took home the Best Country Song Grammy and was nominated for an Oscar while its music video will compete for an ACM Award in April. An aching piano ballad “I’m Not Gonna Miss You” is the haunting reflection of a man with a fading memory, singing to the wife he’ll leave behind. With that premise the hook is rather unapologetic, which matches his bluntly authoritative vocal performance. Campbell also has four other songs on the soundtrack. “All I Need Is You” is an AC leaning string-soaked ballad while “The Long Walk Home” harkens back to his classic work with beautiful flourishes of gently strummed acoustic guitar. The other two songs come from an historic concert Campbell gave at The Ryman Auditorium. “A Better Place” is a beautiful mid-tempo number while the other is a soaring rendition of “Wichita Lineman.” Campbell gives a deeply effecting vocal performance on his classic tune, even ending with a haunting wail of “and I’m doing fine,” which has the audience erupting in cheers. Apart from the man himself, the soundtrack features a revelatory turn by The Band Perry on a cover of his 1967 hit “Gentle On My Mind.” The band shines with the banjo drenched backwoods arrangement that nicely modernizes the tune without sacrificing the unique qualities that endeared it to audiences more than forty-five years ago. The track appears in two versions, which are both excellent. I prefer the ‘single version,’ though, because it leads off with the banjo (opposed to a solo vocal opening by Kimberly) and gets to the goods much faster. Campbell’s daughter Ashley takes the lead on the soundtrack’s remaining two songs. “Remembering” is beautiful autobiographical ballad, accentuated with ribbons of dobro and acoustic guitar, about her promise to keep her father’s fading memories alive. “Home Again” picks up the pace, with gently rolling banjo, and tells the tale of a daughter that has seen the world and now desires to go back to where she came from. The highlight of Ashley’s tracks is how the production perfectly frames her voice, which has a sweet quality not unlike that of another Ashley (Monroe). The rest of the record is excellent, too, because it serves as the perfect snapshot of a man’s poignant reflections as he’s robbed of the life he’s always known. 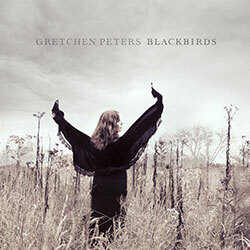 In the months leading up to the release of Blackbirds Gretchen Peters was inducted into the Nashville Songwriters Hall of Fame and she also performed as part of the Poets & Prophets series at the Country Music Hall of Fame with her husband Barry Walsh. The follow-up to her 2012 masterwork Hello Cruel World, Blackbirds is the most personal album of her illustrious career. Peters began the songwriting process for Blackbirds in the summer of 2013, drawing inspiration from a week where she attended three funerals and a wedding. Thus, she explores mortality from varying perspectives, through transcendent bouts of vivid poetry, compositions commanding the listener’s attention without letting go. The exquisitely bleak “Pretty Things,” co-written by Peters and Ben Glover, serves as the promotional single. A raw meditation on the fleeting lure of beauty, “Pretty Things” is a stunning battle cry about gratitude, and our need to appreciate what we have, while it’s still here. Peters co-wrote two other tracks with Glover, a musical partner with which she feels both kinship and safety. The songs couldn’t exude a sharper contrast thematically, running the gamut from murder in Southern Louisiana to an account of a snowy winter set in 1960s New York City. The cunning murder ballad is the title track, a vibrant tale of destruction soaked in haunting riffs of electric guitar. A second version, recorded more soberly, closes the album. The wintry anecdote is “When You Comin’ Home,” a dobro drenched Dylan-esque folk song featuring singer-songwriter Johnny LaFave. Peters, who often does her best work by herself, penned half of the album solo, including the album’s timely centerpiece, “When All You Got Is a Hammer.” The tune masterfully paints the mental conflict raging inside veterans as they readjust to life on home soil. Peters investigates another facet of darkness with “The House on Auburn Street,” set where she grew up. Framed with the image of a house burning down and recounting memories with a sibling, the track beautifully captures quite desperation, but the dragging melody could use a bit more cadence to get the story across most effectively. Peters takes us to California to examine the mysteries of death on “Everything Falls Away.” She asks the questions that remain enigmatic while gifting us a piano based production that stretches her voice to an otherwordly sphere she rarely taps into, allowing it to crack at the most appropriate moments. Her vocal on “Jubilee” taps similar emotional territory, with a story about surrendering once death is near. Like “The House on Auburn Street,” the melody here is slow, and could’ve benefited from picking up the pace a little. Her final solely written tune is “The Cure for the Pain,” which she wrote after a weekend in the hospital with a loved one. The acoustic guitar based ballad doesn’t offer much hope, and rests on the idea that the only cure for pain is more pain. The only outside cut on Blackbirds comes from pop singer-songwriter David Mead. His “Nashville” is a track she’s loved for more than a decade, and she gives it a beautifully delicate reading. In searching for Mead’s version of the song, I was surprised to find a live cover by Taylor Swift, who apparently sang it a couple of years ago in her shows. “Black Ribbons” reunites Peters with her musical sisters Matraca Berg and Suzy Bogguss, for a tune about a fisherman who lays his wife to rest in the aftermath of the BP oil spill. One of the album’s strongest tracks, thanks in a large part to the inclusion of tempo and the background vocals by both Berg and Bogguss, “Black Ribbons” is a brilliant illustration of despair that serves as a reminder of the pain the fisherman in the gulf went through during that time. Blackbirds is masterfully lyrical, setting pain to music in a myriad of different contexts that put the listener at the heart of each story. The end result leaves that listener emotionally exhausted, which is why Blackbirds should be taken in small doses in order to fully appreciate all the goodness found within. Peters has been one of Nashville’s strongest female singer-songwriters for well over two decades now, but she’s only gotten better as she’s amassed more life experience and concentrated on creating soul baring masterworks. Like Hello Cruel World before it, Blackbirds is an album not to be missed.